The days are counting down to one of Kerry’s biggest annual mobilisations of community groups, Tidy Towns committees, voluntary and sporting organisations, and individual residents and families across the county. 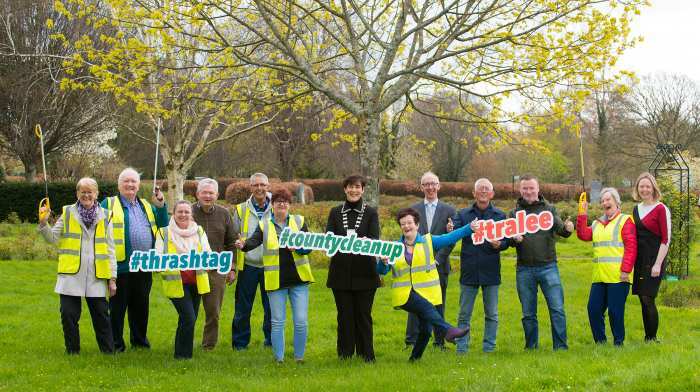 The eighth County Clean Up will take place on Saturday, 13 April and the Cathaoirleach of Kerry County Council, Cllr Norma Foley is leading calls for as many people as possible to get involved. Last year, an estimated 5,500 volunteers took to the county’s roadsides, towns and villages to collect litter and clean up the county with the support of Kerry County Council and KWD Recycling. Local organisations including Kerry GAA, Kerry IFA, and Kerry ICMSA are joining in the effort again this year and have called on their members to join the clean-up and anti-litter initiative on the day. KWD Recycling will again provide clean-up packs to groups which register at www.countycleanup.com and collection points will be designated around the county to ensure that all litter gathered is disposed of. ‘The growing success of the County Clean Up since it was established in 2012, is evident in the huge voluntary effort all over Kerry in previous years and the volume of litter retrieved over the years is indicative of the larger numbers taking part. So let’s again get the county looking spick and span and appreciate the clean and healthy environment which we should never take for granted,’ said Cllr Foley. A record 5,500 volunteers took part in the Kerry County Clean Up in April 2018 which saw 8,000 bags of litter collected, the highest ever tally in the seven years in which the environmental and community initiative has existed.